SeaRobotics Corporation said it has built and delivered two complete autonomous 2.5‑meter unmanned surface vehicles (USVs) to a government hydrographic service. The USVs are complete hydrographic systems, including multibeam echo sounders, support sensors, a cast winch, deployment carts and road trailers. According to SeaRobotics , the contract reinforces the commitment government and commercial entities are making to take unmanned surface vehicles out of the laboratory and research environment and integrate them into the world of professional surveyors. The efficiency and cost effectiveness of each application will be reviewed, and a profile of high-productivity, cost-reducing activities will be developed. Both traditional survey tasks and previously denied areas that remain unsurveyed will be evaluated. This system leverages SeaRobotics’ expertise and history delivering USVs for high-precision bathymetric surveys, water quality analysis, hydrographic surveys and any other applications, the company said. The USV was delivered with a fully integrated R2Sonic multi-beam echo sounder, integrated motion reference unit and dual antenna RTK GPS, surface sound velocity probe and a cast winch with deployable CTD—all tightly integrated with HYPACK software. 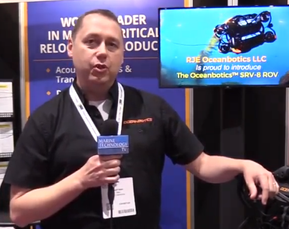 “The 2.5-m USV is one of the smallest systems capable of practical, general purpose MBES deployment,” said Don Darling, president of SeaRobotics Corporation. “The USV will be used extensively for waterways, estuaries and coastal bathymetric surveys,” explained Geoff Douglass, USV development manager at SeaRobotics. SeaRobotics Corporation, headquartered in Stuart, Fla., specializes in small, smart vessels that are remotely or autonomously operated. Its clients include major military and commercial organizations, both U.S. and foreign. SeaRobotics' marine survey software interfaces with most data acquisition hardware, software and sensing systems to produce multi-spectral, DGPS-stamped data for survey, research, or surveillance efforts. Applications for SeaRobotics vessels range from bathymetric and hydrographic surveys to coastal, harbor and riverine surveillance. Many SeaRobotics vessels are small, modular, and man-portable, allowing rapid deployment in remote areas or deployment by larger vessels, and its command and control systems are user-friendly and compact, allowing backpack mobilization.